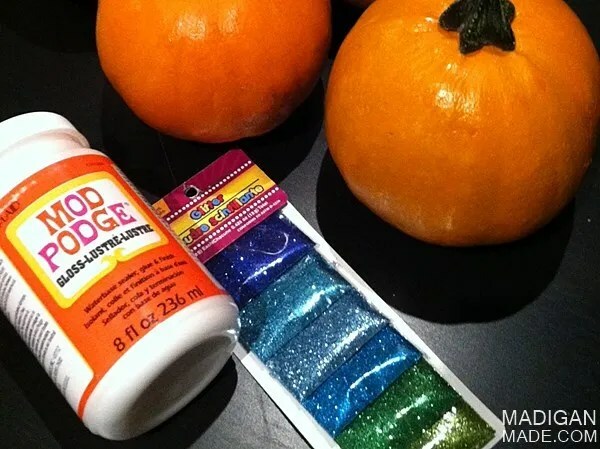 Madigan made… simple glitter covered pumpkins. So, I tried to stay away from glitter this month. I did. I really did. I recently picked up these little pumpkins to take into work. I wanted to decorate them… I considered using washi tape but that ombre pack of dollar store glitter caught my eye in my craft stash. I couldn’t resist it! It was calling my name. And since I was already gilding the lily… I grabbed some gold craft paint, too! Want to see how to make these? First I cleaned my pumpkins. Then, I roughly brushed on some decoupage in vertical strokes. 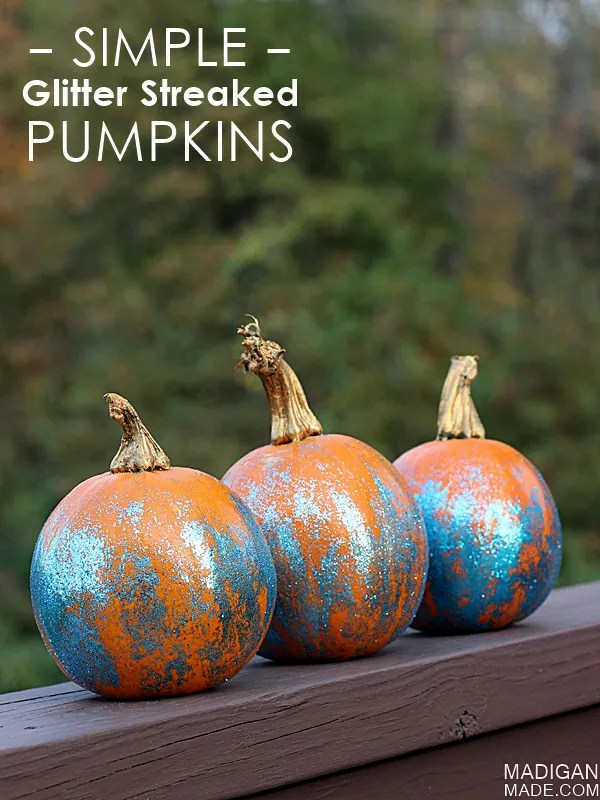 I sprinkled glitter over the decoupage and then used a rag to spread it around over the ribs of the pumpkin in vertical streaks (and rubbed off some of the glitter and glue a little, too). 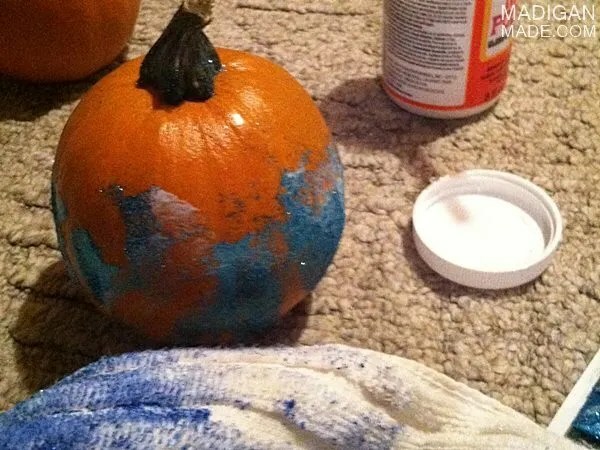 Once dry, I gave the pumpkin 2 more coats of decoupage over top of the glitter to seal it down. Then, I lightly painted the stems with a little gold craft paint. That’s it! 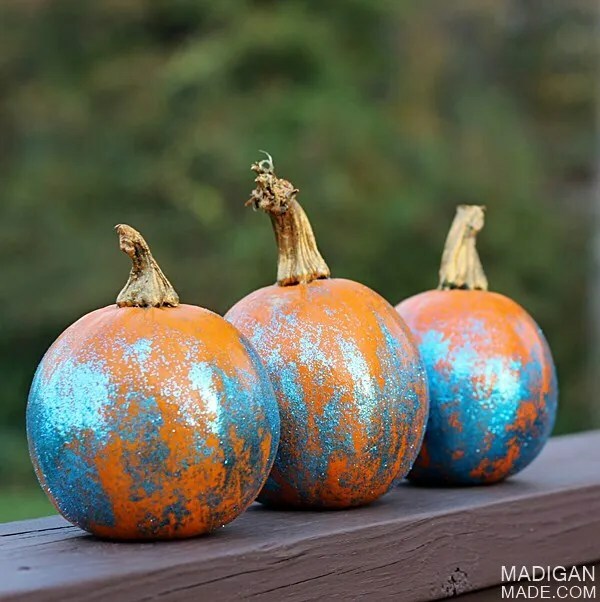 I didn’t really have a plan when I started to make these pumpkins, I just started rubbing the pumpkins with the rag and glitter to see what effect I would get. I really like the uneven texture and streakiness I got within the glitter by applying it this way. 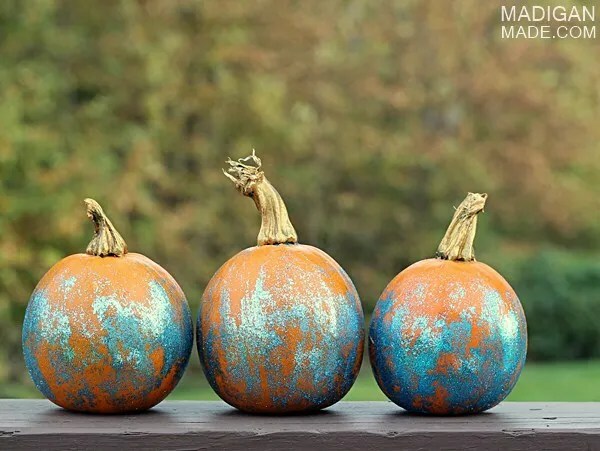 I love these pumpkins. They are glittery. They are fun. They helped satisfy my sparkle fix! P.S. It is not too late for you to get your glitter on, too, this season! I’ll be sharing this project at the Link Party Palooza and The Party Bunch.